I’m thankful for that very first sip of coffee in the morning…I can feel it coursing through my veins and bringing my out of my early morning stupor. I’m thankful for that moment when I rip off my skinny jeans and pull on my sweats…oh sweet, sweet elastic waistband come to mama. I’m thankful for the smell of the first batch of Chex mix of the season…but not so thankful for how quickly it disappears in our house! I’m thankful for dual-purpose decorating. Like being able to easily turn my Fall Mantel into a Thanksgiving Mantel. I’m also thankful for the wonderful invention that is peel-and-stick chalkboard paper. And so thankful that it comes with cutting lines on the back. That wonderful invention of peel-and-stick chalkboard paper allowed me to create a wall of thankfulness. Turning simple silver platters into expressions of my heart. I know that really those are just simple pleasures. They don’t mean as much to me as the real stuff. How absolutely blessed and privileged I am to be a mom to my two precious kiddos. The joyful feeling I experience in watching them grow into these incredible, hysterical, marvelous little human beings. The feeling of being so completely loved by my husband of 15 years. How content we are to sit together in the evenings and talk about absolutely everything or absolutely nothing. I look at those platters and know I will be sharing them with you here and feel so unbelievably grateful to you, that you take the time to come along on this journey with me as I share my heart and my home. And, most of all, I am thankful. Thankful that I am totally and completely undeserving of all of these things and yet God has given them to me. I like to think that I don’t take them for granted…but I’m sure that I do. But this year, I will be walking past that wall of thanksgiving every day. And it will serve as a gentle reminder to stop and remember just how much I truly have to be thankful for. 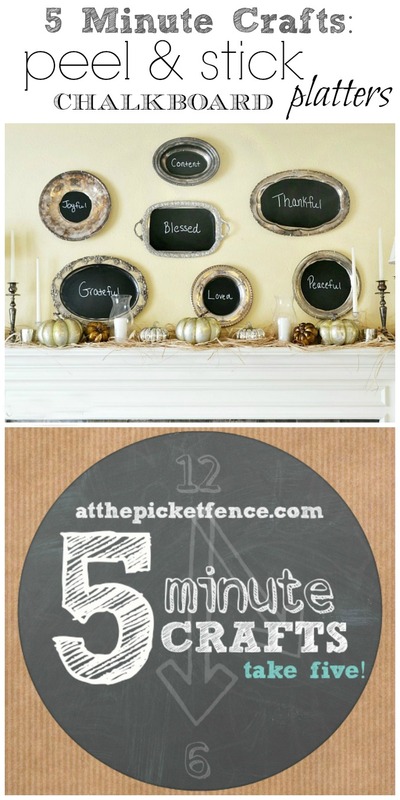 I’m thankful that the peel-and-stick chalkboard platters were so easy that they totally qualify to be part of our 5 Minute Craft Series which happens here every Friday! With all of these incredible ladies! 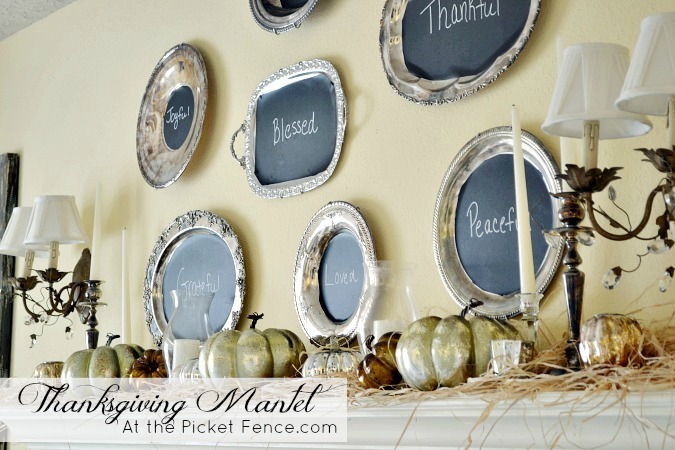 30 Comments on "A Thankful Thanksgiving Mantel"
Love your mantel and the blessings plates are wonderful. I LOVE IT Vanessa!! The silver pieces look beautiful hanging above it and I love the pretty display of pumpkins and raffia you have on it’s shelf too! 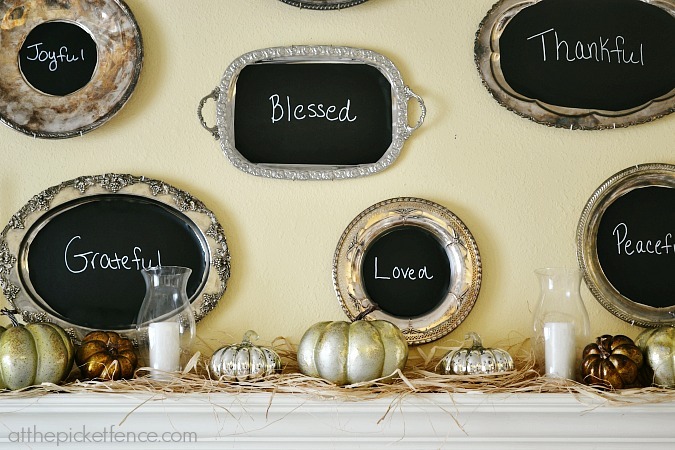 Love your mantel and the chalkboard platters are perfect! Very special, Vanessa! Thanks for sharing! 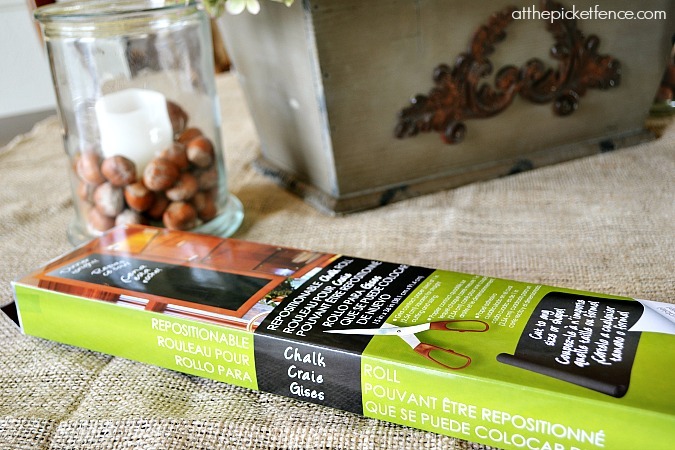 please tell me where I can purchase the peel and stick chalkboard paper! does hobby lobby carry it? I live in Kentucky, if that helps. Hi Cathy! 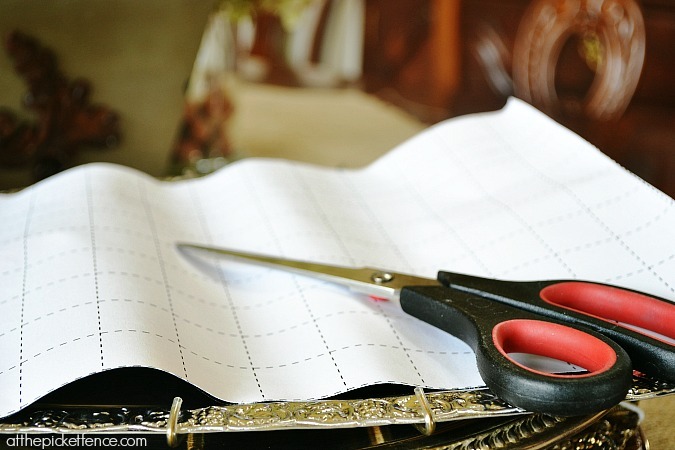 I purchased mine at Michael’s Crafts but I wouldn’t be surprised if Hobby Lobby has it too! I love this! 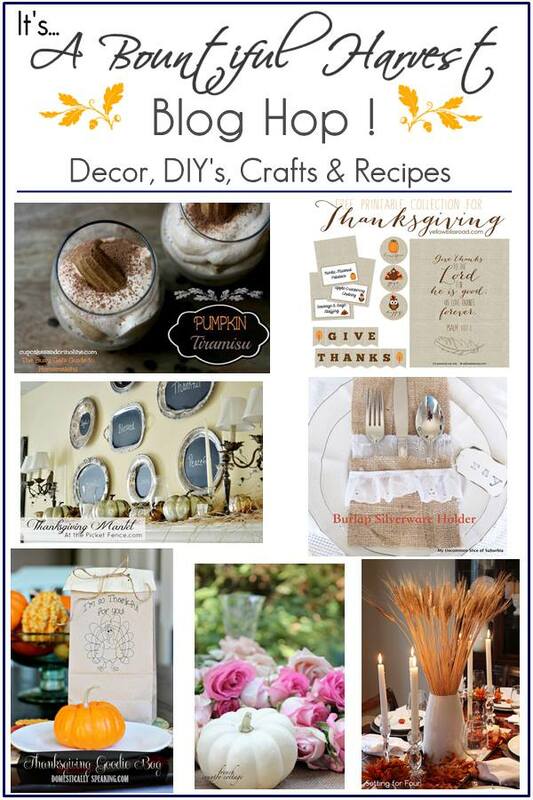 A quick and easy way to add the sentiments of Thanksgiving that looks so pretty, too! You’re just the most creative one! This is lovely. THis is so pretty and I love all the wording! ok where did you get the chalkboard paper? Hoping Michael’s has it, I have a project I wan’t to do but I can only find it online. Hmm, now you have me hungry for some chex mix 🙂 So happy to be partying with you today. Thanks sweet friend! And yes I got mine at Michael’s over where they have the cork boards, etc. 🙂 I’m hungry for chex mix now too! LOL! 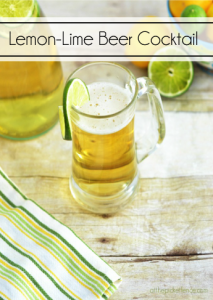 I totally used the same product at my husband’s surprise graduation party and loved it! Love your wall! 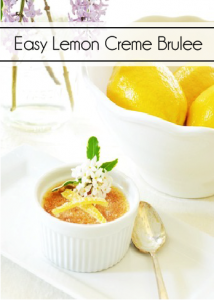 So pretty Vanessa & the fact that it’s super easy makes it even more gorgeous! So beautiful and creative. Where did you find all the silver trays? 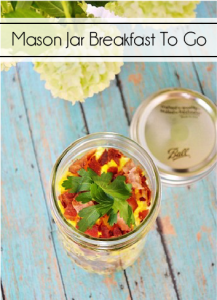 Oh so much fun~ love this idea Vanessa!! Pinning away and happy to be partying with you!! What a beautiful post! Your list is quite long… yes, you are truly blessed! LOVE the manyel and the chalkboard paper! Me too, love my morning coffee! 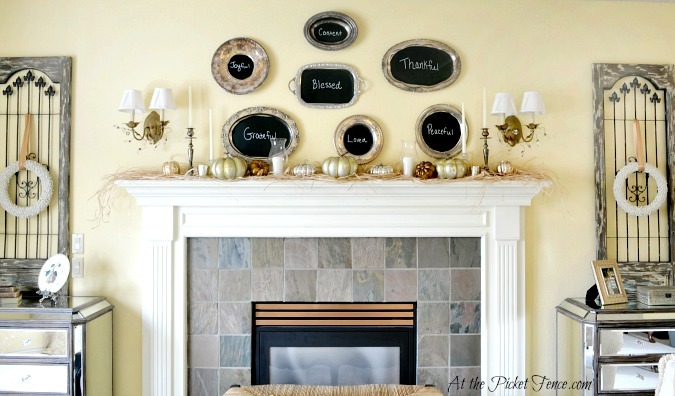 Sweet mantle, so much to be thankful for!!! Oh my goodness ~ you totally rocked my craft world. I had NO idea the peel-and-stick chalkboard ‘stuff’ even existed ~ big woot to my oh so temporary style of decorating. I love the sentiments on each and every platter, your lovely mantel and I am so very happy to be partying, hopping and being Thankful with You. A wonderful expression of all the things we take for granted. A great reminder of what we have to be “thankful” for! Just perfect. 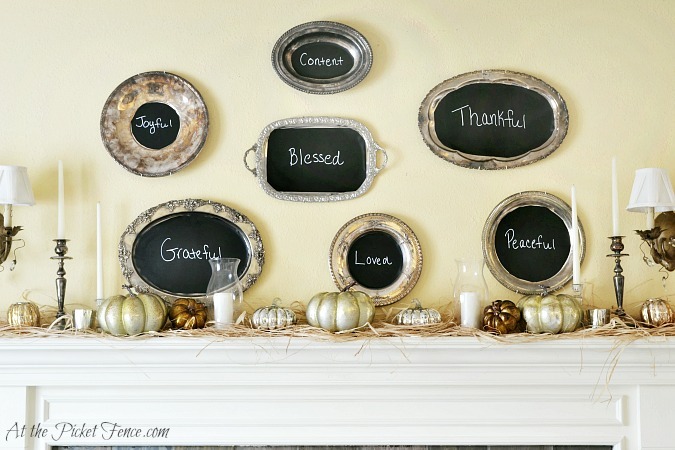 Your chalkboard silver platters are wonderful! Awesome reminder as we enter a season of thankfulness!